I delayed posting this for two reasons. First off, I had some medical stuff that needed to be attended to. Second, I wasn’t sure exactly how I felt about this episode. Let’s catch up so we can begin. 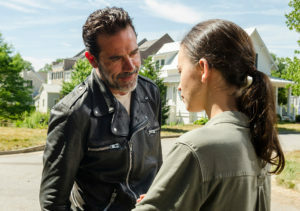 Right out of the gate, I want to make a prediction that The Walking Dead will finally receive its first Emmy nomination for acting and that the nod will be towards Jeffrey Dean Morgan. Though, Melissa McBride and Andrew Lincoln have each been deserving of at least a nomination, season after season, I think JDM will break that snub-trend. Now, my thoughts are going to come at you as randomly as Michonne’s bullets being fired at a walker. Damn, girl, you’d think after all of this time Sasha would have given you some lessons. I’m enjoying the comics-role of Andrea being divided between the TV roles of Michonne, Sasha, and now Rosita. Though we haven’t seen Sasha since the premiere, we already know her character took over the sharp-shooter job that was Andrea’s on paper. Michonne delivered Andrea’s bedside lines to Rick beautifully. And, Rosita is displaying Andrea’s boiling hatred of Negan. Rosita is smart and has mad skills. She just never had the opportunity to shine while surrounded by women like Carol, Maggie, and Michonne. Rosita, your time is coming. Make us proud! I’m still not sure I like the way they broke off Maggie and Sasha from the group, as I feel that Maggie’s reaction to Glenn’s death on paper was much more realistic than what we saw on television. But, I guess we’ll have to wait until next week to see how they plan on playing this one out. Status check: Everyone knows Carol ran away. 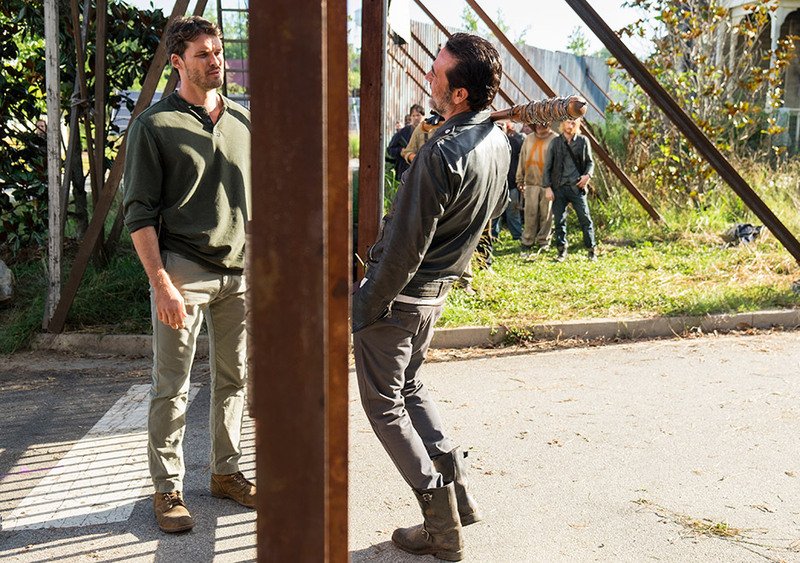 Rick knows, first hand, that Morgan was going to try and find her. No one has seen them since, therefore they do not know that the pair are safely tucked away in the Kingdom. Maggie and Sasha are hiding out with Jesus at the Hilltop. A fact which Father Gabriel managed to cover up with a fake grave in order to protect the women and the Hilltop community. At this point, remember, Negan is unaware of their deal with the Hilltop community. As long as Simon and the other Saviors don’t discover Maggie and Sasha when they come for their routine pick-up, things will be okay. 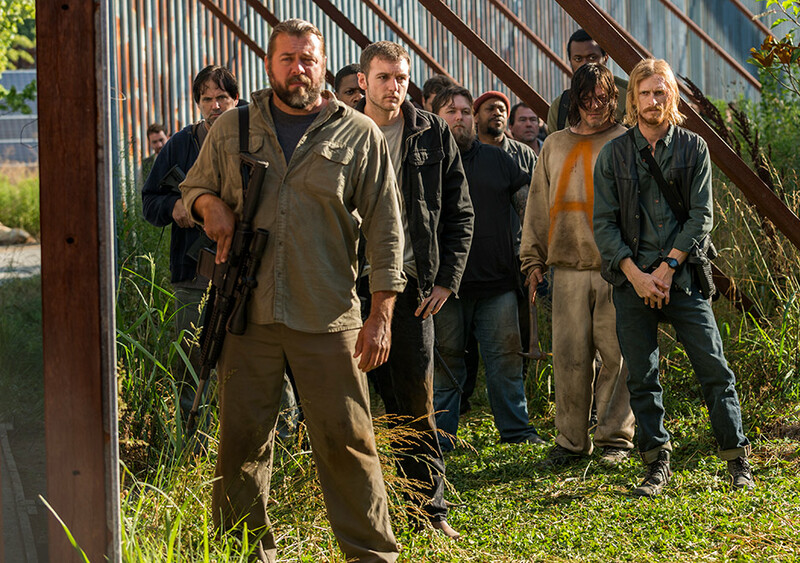 But this is TWD…when are things ever okay? That leaves Tara and Heath, whom we haven’t seen since they raided the bunker. They were planning on a 2-week supply scavenging trip. Boy, did they miss a whole lot of things during that 2-weeks! They’re due back any day now. That’ll be an interesting reunion. Rumors abound that Daryl’s rapid blinking upon arrival was actually Morse Code, his was of sending some secret message to Rick. 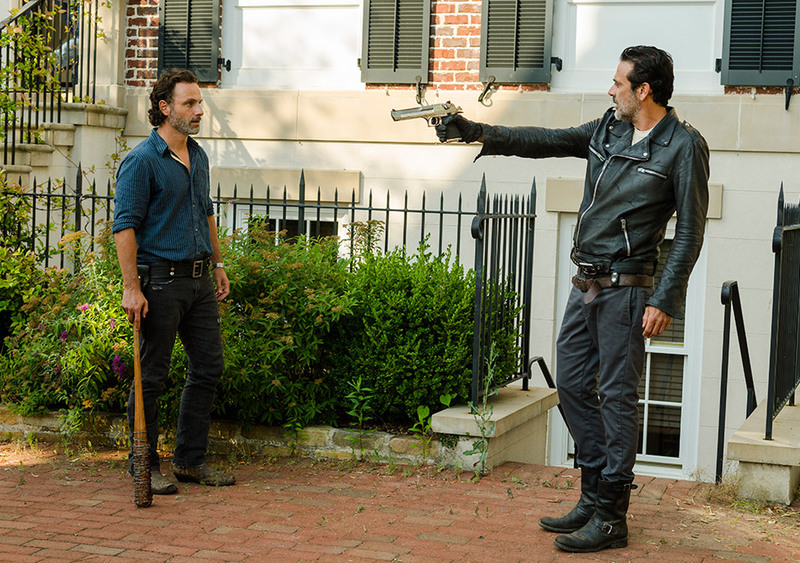 Some claim to have seen Rick tapping out a reply with Lucille. Wrong. Go back and watch. The only shots you see of Rick’s fingers and that bat are the few times he clenches and releases his grip while debating whether or not to crack Negan over the head with it. That’s not to say that Daryl wasn’t communicating. For the first time since arriving in season 5, they made a point to show us the gigantic Morse Code poster hanging in Rick’s living room. Breadcrumbs, my friends. Breadcrumbs. Ruling on the rumor: plausible. Spencer is a douche. His brother was a douche, but a douche who was easily broken. Spencer plays nice, but his secretive behavior and hoarding only prove that even after everything that has happened, he is still not a team player. My only wish is that with all of the comic book accuracy this season, we get to see issue #111 come to fruition, at least where Spencer is concerned. Ugh. Can’t stand him on paper, can’t stand him on the show. I say it every week, but I am really enjoying how much of the dialogue has been lifted directly from the source material, especially with this episode. I don’t know that this particular episode warranted the extended length, but it did stretch out the tension. And, frankly, I could watch JDM make people squirm all day long. The exchange between Negan and Carl, with his “man-sized balls”, was fantastic. Please, for the love of all that’s holy, let their story arc from the comics make it to the series. [Spoiler] In the books, after one of Negan’s visits, Carl stows away on one of their vehicles and shoots a few Saviors back at their Sanctuary before being caught. What follows is a crazy head game and the formation of a bizarre bond that will last for years. Good stuff, right there. Now, let’s talk about Rick Grimes. The internet is all a flutter about the “big reveal” and the “secret” we learned. It was never a secret. Viewers have always known that Shane fathered Judith. At least, those of us who have a basic concept of human biology and can manage simple addition. The only “secret” aspect of it all is that Rick has chosen to never speak about it to anyone. It was time Rick said it out loud and it was nice to see him open up to Michonne like that (awww…love), but I was not happy about much else of what he had to say on the matter. Oh, Rick. Lying to yourself. You knew that kid wasn’t yours back when you found out Lori was pregnant. You accepted it then when you kept yelling it in Shane’s face, marking your territory. But then, when Lori’s reaction to hearing how you and Carl tag-team killed Shane was shock…you cut her out of your life. She was no more his wife than Judith was his child. By the time they got to the prison, Lori was just another member of their group; a ‘chosen’ family in which Rick felt obligated to keep everyone alive. That’s why he lost his damn mind when the walkers invaded the prison. That was the root of his guilt-laden psychotic episode. He abandoned his pregnant wife. She died. What he was left with was a baby. Saying that you had to “accept” she wasn’t yours in order to keep her safe or to love her…um…that doesn’t make you special, Rick. That makes you a decent human being. That was not a personal sacrifice. Carol and Tyreese, even Glenn and Maggie, have been taking care of other people’s children for a long time (though not successfully). If Judith was in any way he personal burden to bear, his constant reminder that he is responsible for whether or not others live or die, that baby would have been dead a long time ago. I know that’s not who Rick is, so I’m going to blame the writers for this one. It was a tad muddled for me. Especially given that back then, Rick was still very much “Officer Friendly” and there’s no reason he would ever have not accepted Lori’s baby – Carl’s flesh and blood – as his own. I think he still harbors resentments and great amounts of guilt over how things ended with both Shane and eventually Lori. Hell, he almost did the exact same thing as Shane when he met Jessie. Quit your whining, Rick. You’re just scared. We all are. But sack up for gods’ sake and stop blaming your current lack of control on the fact that you have a baby. You call Daryl your “brother” but need to find it within yourself, in an apocalyptic scenario, to “accept” the baby your wife carried. Sit back and let the women drive for a little while, sir. What are your thoughts? 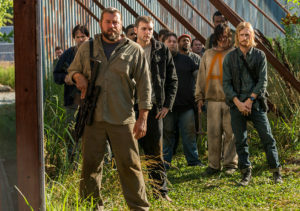 Those Saviors really shouldn’t have burned all of those mattresses.